Monye made his England debut in England's 39-13 victory over the Pacific Islanders at Twickenham in 2008 and started the rest of the autumn internationals against Australia, South Africa and New Zealand. Known for his blistering pace, Monye was a key member of the England Sevens squad throughout the 2002-03 and 2003-04 IRB World Sevens Series, and was part of the team that competed in the 2005 Rugby World Cup Sevens in Hong Kong. He was also part of the England Saxons sides that won the Churchill Cup in 2005 and 2008. 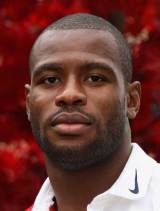 As a student at Lord Wandsworth College, best known for producing Jonny Wilkinson, Monye played for Hampshire U17s and U20s, as well as achieving success on the track, appearing in the English Schools Athletics Association Championship. In deciding which to pursue, Monye was fortunate that his former sports master Tim Richards put him in touch with Harlequins U19 coach Colin Osborne. When the club offered him a professional contract after a few games he jumped at the opportunity and within 12 months he was a member of the England Sevens team that had won the Hong Kong Sevens. Selected for the 2009 Lions tour of South Africa and made the XV for the first Test in Durban where he came agonisingly close to scoring two tries. In the first half he was thwarted from scoring as he dived over the try line but Jean de Villiers got his hand underneath the ball to prevent a try. In the latter stages of the second half, Monye was through to score but was tackled by Frans Steyn and lost control of the ball. The Lions lost the Test and Monye also lost his place being replaced by Luke Fitzgerald. The Lions lost the second Test and Monye was recalled, redeeming himself with a 70-metre intercepted try as the Lions restored pride, losing the series 2-1. Monye went on to feature four times in the 2010 Six Nations but his appearance against Scotland at Murrayfield on March 13 proved to be his last for some time. He failed to make the cut for the Rugby World Cup in 2011 and started the season as part of the Quins team which went on to go 14 matches unbeaten on their way to a maiden Aviva Premiership crown. An England recall followed, but after struggling with a hamstring issue Monye suffered a serious head knock in a tour game against the South African Barbarians, stunting his progress back to a Test spot.